Water insoluble, solid compounding ingredients are converted into water-compatible, homogenous, aqueous dispersions by grinding the materials in a water medium using specialized mills. The resultant dispersions have a uniform particle size with a consistent,stable viscosity. These dispersions can be used in a variety of water-based applications, such as latex, latex foam, adhesives, and coatings. Akron Dispersions has been providing reliable, high quality water-based dispersions since 1958. Latex and other water-based polymeric materials can be “compounded” or formulated with a number of ingredients to ACHIEVE, ENHANCE, STABILIZE, and PROTECT their unique physical and chemical properties. These chemical ingredients are added to the latex in the form of fine particle size, water-based dispersions and emulsions. Particle size, a critical factor in the manufacture and selection of an aqueous dispersion, is characterized not only by particle diameter but also by the frequency within a given size range, the particle size distribution. At Akron Dispersions, we employ sophisticated laser diffraction instrumentation to measure these critical parameters to assure batch to batch uniformity. 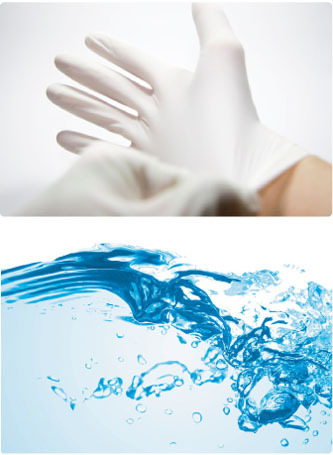 High performance latex compounds begin with consistent, reliable aqueous dispersions. WE KNOW THIS. For years we have been helping our customers design and formulate latex compounds for critical applications. Our goal is to provide you with exceptional products and service. Give us an opportunity to serve you. Some of these products are specific to the latex industry. However, Akron Dispersions can also supply proprietary materials and formulations tailored to your specifications for any application.